We got an early start again and headed up to Mesa Verde National Park, which has some really cool ancient cliff dwellings that you tour. In the summer. In the winter, you can only drive a 45-minute loop to take a picture from the hillside. So we skipped it, sadly. We stopped at 4 Corners. Nick put limbs in 4 different states at same time. We also got a Navajo Taco that wasn’t very good. The detour for Mesa Verde had set us behind schedule slightly, so we ended up having to drive over 500 miles. We have to say, the scenery was a little repetitive and boring. 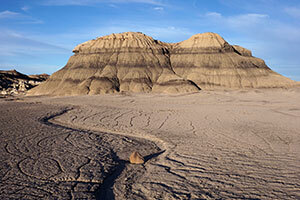 One highlight however, was the Bisti Badlands. This area used to be a mighty river delta, which carved some really cool features into the landscape. We saw some pieces of petrified wood and several different types of rocks. The ground was also covered in a salty/chalky white substance, which was strange. At some points along the drive, it looked like we were in a plains region, but then you could see where the river delta had cut through the land millions of years ago. We drove through a large Native American reservation, and were a bit saddened to see the amount of litter on the side of the road – which wasn’t something we hadn’t seen at all driving down the coast. We stopped at a Fuddrucker’s because Katie had never been there and she had been intrigued by the name when we were in Austin last. It was pretty good, but sadly they had removed the games. The last part of the drive into Alamogordo was fairly boring as it was at night. And we were in New Mexico. The main highlight was the Holloman Air Force Base, which was the location of the Trinity test (the first explosion of a nuclear weapon). Tomorrow we have a packed day. We want to see Pistachioland, White Sands, Roswell, and Carlsbad Caverns. Hopefully the post for tomorrow will be written from Texas. Today was the first day we realized our trip will be coming to an end soon, which has made us really sad. This has been a really fun trip for both of us. Luckily, we still have that 2nd drive, so we will get to see even more! Alamogordo "new Mexico" "4 Corners" "albuquerque"